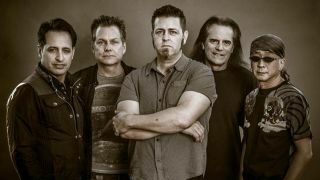 Spock’s Beard have announced the return of former drummer Nick D’Virgilio for their next album. He left the band in 2011 but recently got back behind the kit with them on the recent Cruise To The Edge festival following the departure of Jimmy Keegan in October last year. The band say in a statement: “Spock’s Beard is super excited to announce that the amazing Nick D’Virgilio has agreed to play on our next album! “Nick, of course, is well known to Spock’s Beard fans as our former drummer, lead singer and all around awesome dude – as well as for working with artists such as Genesis, Mike Keneally, Peter Gabriel and Big Big Train among others. “Nick was with us when we first started and we are over the moon to have him back with us for this album! We know you’ll be as excited as we are to hear what we will be able to create with him back pounding the skins. The band’s last studio album was 20125’s The Oblivion Particle, which launched in August 2015 via InsideOut Music.